Liverpool Sound City have announced a brand new all-dayer in partnership with The Studio in Widnes. 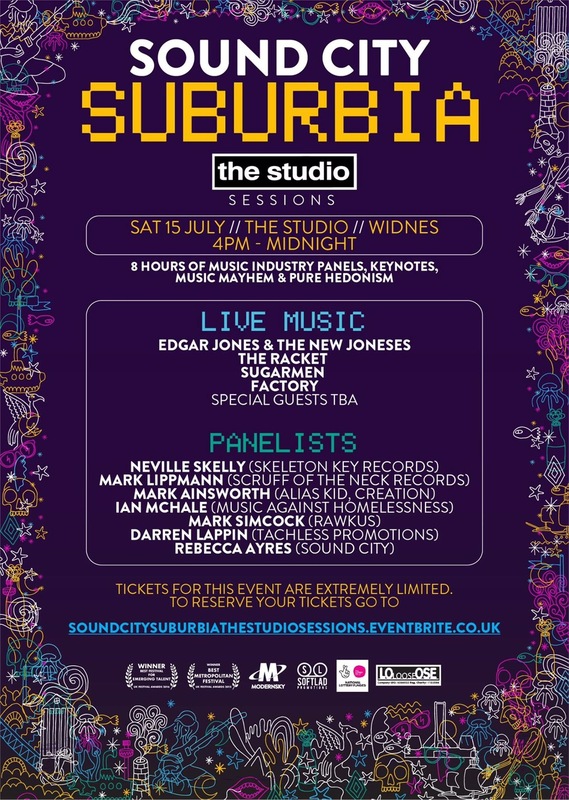 The mini-festival Sound City Suburbia: The Studio Sessions takes place Saturday 15th July at The Studio, Widnes, featuring eight hours of live music and panels that are sure to create a brilliant day. The music comes from Edgar Jones & The New Joneses, The Racket, Sugarmen, Factory and more to-be-announced special guests. The music is accompanied by special panes throughout the day featuring Neville Skelly (Skeleton Key Records), Mark Lippmann (Scruff of The Neck), Mark Ainsworth (Alias Kid, Creation), Ian McHale (Musicians Against Homelessness), Mark Simcock (Rawkus), Darren Lappin (Tachless Promotions) and Rebecca Ayres (Sound City). Tickets are extremly limited and are available now.